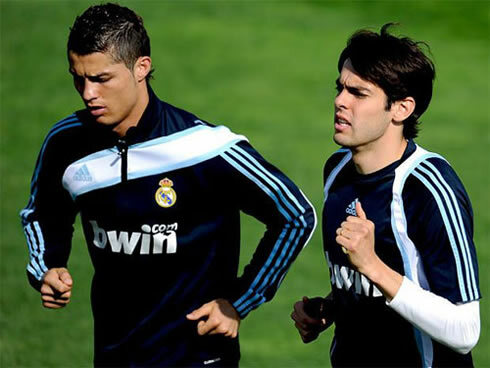 ﻿ Kaká: "Cristiano Ronaldo is a more complete player than Messi"
10.11.2011 » Kaká: "Cristiano Ronaldo is a more complete player than Messi"
Kaká granted a big interview to the Brazilian show "Kajuru Pergunta" and talked about many topics. Kaká revealed details about his fight for overcoming the injuries, the Cristiano Ronaldo vs Messi debate, as well as his relationship with José Mourinho and the other Real Madrid players. Real Madrid player, Ricardo Kaká, granted a big interview to "Kajuru Pergunta" this week and once again, he showed his humble side and the tremendous human qualities that everyone recognizes in him. The Brazilian player is the first to admit that his first two years at the Spanish club have been very frustrating for himself, for not being able to become an important player for the team, but he still believes that the old Kaká from AC Milan will show up in Real Madrid. Among many topics covered on this interview, Kaká also insisted on discussing with Jorge Kajuru about how good Cristiano Ronaldo really is. Kaká defended CR7 from all the "attacks", and stated more than once that Ronaldo is the most complete player in the World, leaving no room to competition from Barcelona's Lionel Messi, or Neymar from Santos. As mentioned above, the interview was really big and the talk between the interviewer and Kaká lasted almost an entire hour. One of the first topics approached was related to the Brazilian's constant fight against the injuries he has been victim of in the late years in Milan, but specially since he arrived to Real Madrid. Kaká, who is also known for being a main of faith, commented: "I'll always have hope to become the kind of player I used to be in AC Milan. But it's true that I've been through a very tough period. I never thought about giving up, but it has been really hard. I was feeling like a robot, with my movements being constrained and very limited physically, without strenght in my legs to make the difference on the field. For a long time, I felt very bad because I kept training and training and at the end of the day I only had pain and there were no signs of the "old Kaká", that everyone keeps me asking if we'll ever see him back. ", said the Brazilian. Despite many rumors indicating that Real Madrid and Mourinho were attempting to sell Kaká over the last summer transfer season, the Brazilian player revealed that he had a few talks with José Mourinho, on which the Portuguese coach expressed his wish to keep him in the club. Kaká: "Those rumors were all lies. I talked with José Mourinho and he clearly told me that he didn't want me to leave. I immediatly replied him that I also wanted to stay, so he said he will fight and defend me whenever it was necessary. I was then told to not to worry about anything that was about to come on the newspaper that summer, because it was more than predictable that rumors about a potential transfer were going to be everywhere on the media", noted Kaká, when referring to the many transfer rumors he has been linked with, over the last transfer season. About a pertinent question regarding if we'll ever see the AC Milan Kaká version in Real Madrid, the Brazilian is confident things will go his way soon. Kaká: "I'm not sure if I'll be the same player I was in Milan, but that's the motivation that drives me everyday to get up and training. Not necessarily to be the same I was in AC Milan, but to be again a decisive player, with those long runs where I was able to help the team." The Brazilian Ronaldo ("Fenómeno") remains being Kaká's all-time idol and he compared him with a few other countrymen, besides the French Zidane: "Ronaldo is the best player who I've played with, side by side. I never played with Zidane, only against him. For all his geniality and speed, Ronaldo is my favorite, even though Ronaldinho is actually very close to him. Regarding Neymar, what I can say is that if he keeps developping, he's going to get places. I'm not sure if he'll be at Maradona or Messi's level, but I would like to see him coming to Europe and Real Madrid", said Kaká before knowing that Neymar had actually renewed his contract with Santos, until 2014. However, when he was asked about who are the current best players in the World, the Brazilian replied with Cristiano Ronaldo and Lionel Messi. Kaká then ranked Cristiano Ronaldo as the most complete player in the World, because Kajuru, the interviewer, started suggesting that he had picked the Portuguese player just because they are good friends and teammates at Real Madrid. Kaká: "What I can tell you Kajuru, is that in the modern football, Cristiano Ronaldo is the most complete player you can find in the entire World. He scores with his left foot, right foot, head, from free-kicks and everything else you can come up with. Messi is an excelent player with all his geniality and his talented left foot doing his usual little touches, but if we analyze them purely on how complete they are, Cristiano Ronaldo is the most complete player out there." Kaká then confirmed Scolari statements regarding Cristiano Ronaldo constant seek for perfection when it comes to training. Kaká: "That's true. For more than once, when I'm already leaving the training camp, I've noticed that Ronaldo is still practising in one the training fields we have there, doing his tricks and perfecting his moves." noted the Brazilian player, before adding that Cristiano Ronaldo is a very nice person, unlike what the press attempts to show to the public. A surprising revelation came right after, when Kaká announced that the teammate who he has the best relationship is the Portuguese Ricardo Carvalho. Kaká: "Ricardo Carvalho is the person who I am closer with, and the guy who I talk the most. He's my best friend at Real Madrid." Kajuru: "I still don't agree with your claiming that Cristiano Ronaldo is the most complete player in the World. I keep thinking you're just saying that because you two are very good friends..."
Kaká politely replied: "Kajuru, it's my opinion because I train with him everyday. But now that you insist, please tell me names of players who are more complete than Ronaldo?" Kaká: "How many goals did Neymar score from free-kicks this season? How many goals did he score from headers? How many goals did Messi score this season from headers?" Kajuru: "Now that you mention it..."
Kaká: "Please note that I'm not claiming that Cristiano Ronaldo is better than Messi or Neymar, I'm just saying that he is a more complete player than them or anyone else in the game. I'm talking about how complete he is, in terms of versatility. Cristiano Ronaldo's left foot shot is the same as his right foot for example. In terms of taking free-kicks, I can only name one player who can be better than him and that's Juninho Pernambucano." One of the last notes that I believe it was worth noticing from this interview was when Kaká compared Barcelona and Real Madrid playing styles while analyzing the differences between the two clubs culturally. Kaká: "What Barcelona has, that most of the other teams don't have, is the ability to have the ball's posession for so long. It requires a lot of time training together, talent, technique, patience, etc. That's a style of playing that is related to the characteristics of the players, as well as the coach. I think we'll never see Real Madrid playing in the same style as Barcelona does, not only because of what I just mentioned, but mostly due to the fact that Real Madrid fans are not that patient. If we ever attempt to do a similar game, passing the ball around so much without attacking, we'll immediatly start hearing a few whistles and boos from the crowd. So I believe it has also to do with the club and the city's culture", noted Kaká. Kajuru then asked Kaká if it isn't Messi the single factor that makes the difference when comparing Barcelona with many other teams. Kaká: "It's true that he is a great player and certainly helps the team being better. However, why can't Messi be as decisive in the Argentina National Team as he is in Barcelona? It's just a question and I don't know the answer, but it help us understanding that football is a colective game and we always depend on what our teammates can do." Most of the 1-hour lenght interview has also been focused on talks about Neymar and many other topics regarding Kaká's career and personal life. For those who understand Portuguese, I recommend watching the full interview video posted on the top of the article. Unfortunately, I don't have the time to make a full translation from the interview, but the most important ideas exchanged during the talk were already referred and reported on this article.